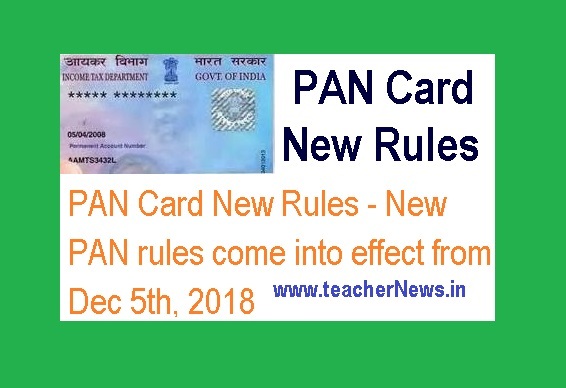 PAN Card New Rules - New PAN rules come into effect from Dec 5th, 2018 : The Department of Revenue has put into effect new rules with respect to Permanent Account Number (PAN) from December 5 to check tax evasion and allow more options to the taxpayers. PAN Card Correction Form Download Pan Card Fees 2018 Pan Card Signature Minor Pan Card Application Form Sample, NSDL Pan Card Centre, Pan Card Application Form Pdf 2019. The Income Tax Department has introduced some important amendments to the Permanent Account Number (PAN) card rules effective from 5 December 2018. If you are going to apply for PAN on or after December 5, 2018, then you will not be required to mandatorily quote your father's name in the application form. This rule will be applicable if the mother of the applicant is a single parent. The application form will now give the applicant an option as to whether the mother is a single parent and the applicant wishes to furnish the name of only his mother. Furnishing father's name in application form not mandatory anymore Until now, those applying for PAN were required to furnish their father's name in the application form which is also printed on the PAN card. Entities doing business over Rs. 2.5 lakh must have PAN According to another amendment, it is now mandatory for all entities, other than individuals, entering financial transactions worth Rs. 2.5 lakh and above in any given financial will have to get a PAN card on or before May 31 of the next financial year. Such entities include Hindu Undivided Families (HUF), firms, charitable trusts and associations of persons, body of individuals, local authorities, and companies. Another new rule extends tax officials' authorization until today, tax authorities were allowed to specify formats and verification standards for the submitted documents and Aadhaar information. They were also responsible for ensuring secure capture/ transmission of data, implementing appropriate security, and archiving and retrieving policies related to the furnishing of PAN application forms. PAN Card New Rules New Pan Card Image Tatkal Pan Card Lost Pan Card Pan Card Signature Duplicate Pan Card Business Pan Card Pan Card Seva Pan Card Login. PAN refers to the Permanent Account Number. Now days the confirmation of pan card totally depend upon the aadhar details doesn't matter what details specified written. They check aadhar details online direct from website ( panseva ). If you pan application details match aadhar detail like name ,date of birth and gender than they verify your request for further process. To check the PAN card validity online, and click on the Know Your PAN button on the left side of the screen.